I need a Duracell 504 15V and found that Exell were making a lot of vintage battery replacements. Last I looked a few years ago there wasn't a source I could find for those discontinued types. Cost still puts me off, but nice to see someone is doing it. I'm thinking (4) 45V batteries at $120 isn't in my future. I still have that Mallory cell somewhere, I'll test and photograph when I find it again. It was in a box of parts in an unheated garage! Part of an estate. On DA: I had a Sytek preamp go squirrelly after 20 years, symptom being gain that would zipper up and down by a few dB, almost like an oscillation. Seems like a possible cause. Not all channels, 2 of 4. This morning's voltage read was 1.546V. Higher than yesterday and could be measurement error. I only leave the meter connected for about a second since I don't want its 10MΩ load to discharge it too much. Likewise if you charge the cap from a stable DC it would keep drawing a tiny current for a similar while after nearly full. Doug: Do you suppose that the increased series R of the vintage capacitors might be due to a combination of heat, voltage/current and epoxy/Bakelite reacting to form an oxide or crud on the plates? Similar to cathode crud? Maybe lead attachment to plates junction? Semi OT: I'd like to put together a jig to test DC leakage current in Al caps. I don't have a high voltage DC bench supply. +/- 20VDC is all I've got. I have a variable auto former and was thinking I could make a full wave rectifier from diodes. This of course would be dirty DC without any filtering. Would the raw DC be okay for testing DC leakage current? How high a voltage do you need? The auto-transformer won't provide any line isolation which you really want from a safety viewpoint. You could use an autotransformer adjusted to a low voltage and a 120:24 transformer in reverse (24:120) to obtain a poor-man's isolation transformer. Doug - I think you mentioned that they battery was physically clipped to the cathode terminal. Was it electrically connected from the cathode to ground where we would normally see a resistor? Thanks. 100VDC is probably the highest voltage cap I use on a regular basis. The variac into a reversed 120:24 transformer is a good idea and I have some on hand. You might be able to get a sense of good/bad parts with phantom power (48V DC), and a sensitive ammeter (VOM). I have a few different power transformers. I’ll throw a few in a box with a bridge rectifier and some binding posts to patch in what I need. I mostly want it to test big computer caps in power supplies. Those caps can be upwards of $40 each sonits worth taking the time to test them. It’s not worth the time to test a $0.25 cap. Before I borrowed a proper 500V tester I rolled my own high voltage supply with some common transformers I had laying around. Connect 120V to the primary of one, and connect all the secondaries together in parallel. Then string the floating energized primaries in series. I stacked up 4x28V transformers to make 480V... Of course be careful... I think I put a 1/10A fuse in series with first primary but it could still make hazardous currents at deadly voltage. I didn't want to post this yesterday on April Fools Day. The peak voltage this morning was about 1.56V. After leaving the meter on for a few seconds it "discharges" and actually goes negative a bit. 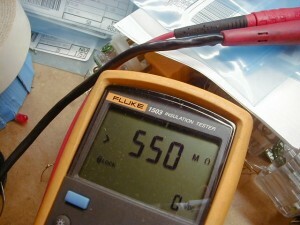 Removing the meter and allowing a few seconds for recovery and re-measuring shows about 1.56V again. Dielectric absorption is sort of like stubbornness. The failure to self discharge seems unusual... Either extremely high impedance for internal distributed capacitance, or perhaps a non-linear self discharge characteristic.